Intourist-Petrozavodsk becomes Karelia's Leading Tour Operator! Petrozavodsk, Karelia, September 2014 — Karelia celebrates World Tourism Day and congratulates travel companies and hotels with the successful summer season. Annually on the World Tourism Day Karelian government awards leaders of Karelian Travel Industry. Nominations are considered by a group of industry experts, and the voting includes participation from travel and tourism executives, tour operators and travel agents. Seven of the Karelia's Travel Awards categories focus exclusively on Karelian travel market including Karelia's Leading Hotel (won by Hotel Severnaya, Petrozavodsk), Karelia's Leading Tourist Complex (won by Gardarika, Sortavala District), Karelia's Leading Guest House (won by guest house Tamara, Suoyarvy District), and Karelia's Leading Tour Operator (won by JSC Intourist-Petrozavodsk). For the fourth time our company has the honour of becoming the best tour operator on the Karelian Travel Market. 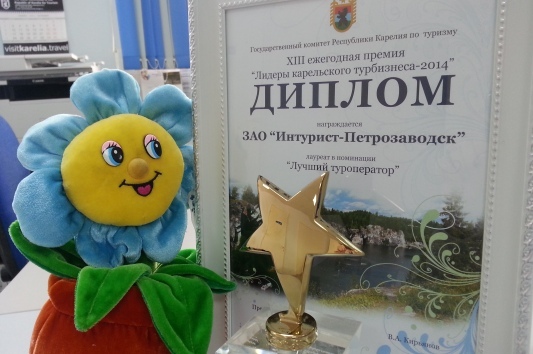 This award serves as a testament to our love and dedication to Karelia and travel. It is with the feeling of gratitude that we accept this honour and promise to be worthy of such a grand title. None of our success, either small or large, will ever be possible without our beloved customers. We appreciate your trust and continue to do our best to make your stay in Karelia a vacation of a lifetime!